The awards are divided into three sections based on the number of years of practice. A panel of 5 judges consisting of 3 members of the Hayes Center for Practice Excellence Advisory Board, the Director of HCPE and Dr. Jerry Hayes will review all submissions and check for proper eligibility and truthfulness. In the event the panel of judges determines that there are no qualified or suitable applications submitted for a particular award, then they may elect to refrain from selecting a winner and no award will be given. Any questions regarding the award should be directed to [email protected]. Nominations are now closed for the 2019 HCPE Practice of Excellence Awards. 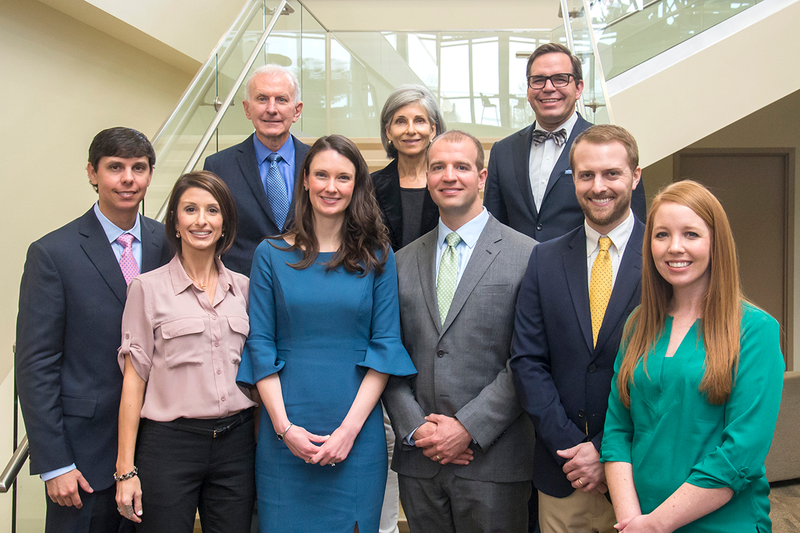 The Hayes Center for Practice Excellence at SCO is pleased to announce the 2018 recipients of its Practice of Excellence Award: Drs. Kevin Rogers, '08, Courtney Shay, '12 & Timothy LaFreniere, '12, and Canaan Montgomery, '14. The award recipients joined other ODs in speaking to SCO third-years as part of today's Bon VoyEyes program in which students begin preparing for their fourth-year externships. Read more in this SCO News story. Pictured are Kevin Rogers, OD '08, Kourtney Rogers, Courtney Shay, OD '12, Timothy LaFrenier, OD '12, Canaan Montgomery, OD '14, and Rebecca Montgomery, with Jerry Hayes, OD '73, Cris Hayes, and Nathan Hayes.